The world could be a very different place if more women were in charge. You just need to look at what we did on International Day of the Girl last year to see what that world could look like. By persuading leading public figures, including the President of Nepal and the President of the National Assembly of Ecuador, to stand aside for the day, over 300 girls and young women in more than 50 countries were able step into their shoes and call on governments around the world to tear down the barriers that deny millions of them their rights. I took part myself by supporting a 17 year old girl from Zambia to take my place for the day. It was a humbling experience, and I learned so much from Loveness about her life, her ambitions and about her potential. Across the world, the "takeovers" were a brief but powerful glimpse of the world we want to see. Our aim was to change perceptions about what is possible for young women and girls, and to inspire millions of them around the world to demand that their voices be heard. Our challenge now is to make a future in which every girl has the chance to take up positions of political leadership – for more than just one day. It’s a big challenge. Things are improving, though progress is slow. The proportion of women in parliaments globally has more than doubled since 1995, but still stood at only 23% in 2016; and while only Haiti, Micronesia, Qatar and Vanuatu have yet to elect any female legislators, just three countries have achieved gender parity in their national parliaments. Last year saw examples of women entering high office – while Hillary Clinton narrowly missed out, Theresa May became the United Kingdom‘s second female prime minister, and Estonia, Taiwan and the Marshall Islands all elected their first female presidents. The cities of Tokyo, Rome and Bucharest elected their first female mayors. Yet these advances are against a low base. In March 2015, only 14 governments around the world were led by women, with representation at local level lower still: fewer than 5% of the world’s mayors are women. Parity is only one indicator of progress, however. Unfortunately we know that female leaders are often treated more harshly in the media based on their looks; taken less seriously by their peers; and women in politics and in business must still navigate systems that were designed and maintained by men for centuries. Is it any wonder so few young women and girls consider putting themselves forward for leadership positions or elected office? This matters. If we are serious about achieving the development goals we’ve set ourselves, we need to be serious about empowering women, and especially girls, to learn, lead, decide and thrive. Developing the leadership capacity of girls in particular not only helps them to secure better livelihoods and better health today, but can also create a generation capable of delivering future change. 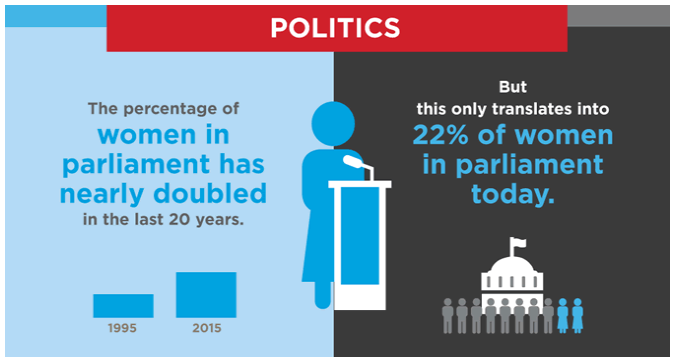 Women’s political participation is a crucial accelerator of progress. And we need to accelerate change if we are to safeguard development through better decision making. Of course, democracy that excludes half the population from leadership positions will ultimately fail: reducing the gap is an essential part of creating the responsive and responsible leadership we need in a changing world. But a case can also be made that it is smart to invest in encouraging female leadership: when women have an equal footing in making choices, things change faster. For example, research on panchayats (local councils) in India found that the number of drinking water projects in areas with female-led councils was 62% higher than in those with male-led councils. Moreover, greater female participation not only increased the provision of public goods, but also reduced levels of corruption. Investing in the leadership skills of girls is vitally important, but must sit alongside investment in economic, social and environmental improvement. It should not be seen as secondary. It is an essential part of the package. Closing the gender gap in the realm of political leadership will accelerate progress on narrowing the social and economic gap too. We should not lose sight of the fact that girls have equal rights as boys to lead. We will continue to support them to speak up for themselves, to make decisions about their own lives and take the positions of power to which they are entitled. And we will continue to encourage men – fathers as much as male authority figures and leaders – to make space into which the world’s daughters can grow. Through our successful girls’ takeover on last year’s International Day of the Girl, we showed what the leadership of girls and young women looks like. In 2017 we aim to mobilize even more young women and girls, ensuring their voices are heard like never before. In doing so we hope to inspire more support and investment in their right to lead and create a better world for all.